As a pioneer in cleanroom technology, since 1978, Esco has been creating controlled environments for the electronics, semiconductor, pharmaceutical, food, biotechnology, nanotechnology and other high technology industries. Today, increasing quality and process demands in these and other industries require the control of particulate contamination to stringent standards. Esco Soft Capsule Soft Wall Cleanrooms are an ideal solution when clean air areas need to be created on a small to mid scale. Flexible and economical, they may be easily relocated when application requirements change. Esco offers a complete range of soft wall cleanrooms to meet various construction, dimensional and cleanliness class requirements. Standard 2' x 4' (0.6 x 1.2m) cleanroom ceiling grid enables flexible placement of fan filter units. Non particulate shedding phenolic resin panels are provided to cover empty bays. Cleanroom-grade construction utilizing full welded, reinforced, steel tubular sections. Structure is finished with an abrasion resistant oven-baked powder coat. Built-in warm white, electronically ballasted, 5000k lighting provides excellent illumination of the cleanroom and reduces operator fatigue. The reliable lighting system is zero-flicker and instant start. Tear-drop design does not interfere with the laminar flow in the cleanroom. Isostat vinyl curtains isolate the cleanroom from the ambient environment, while allowing for easy passage of materials and personnel in and out of the clean area. Vinyl curtains terminate at a specific distance above the floor to allow for exhaust of clean air out of the cleanroom. Stainless steel swivel casters feature nonshedding polyurethane wheels. (Capacity: 300 lbs each). Centrally mounted control panel enables rapid startup of fan filter units and lighting. 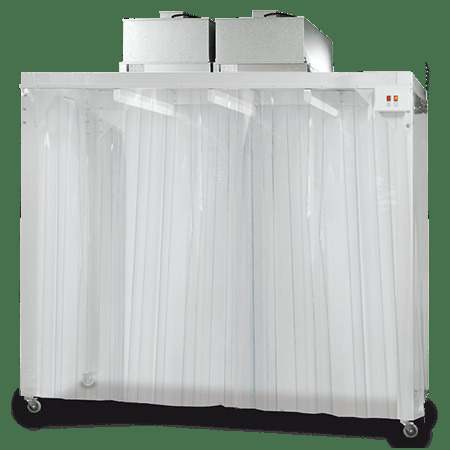 Esco Airstream Fan Filter Units incorporate German made ebm-papst permanently lubricated, direct drive, centrifugal blowers with external rotor designs, and Swedish Camfil-Farr HEPA/ ULPA filters. The energy efficient external rotor motor design reduces operating costs and has extremely low noise and vibration levels, improving the working conditions in the cleanroom. High quality HEPA filters utilizing an improved mini-pleated separation technique to maximize surface area improves efficiency and extends the filter life. Filters operate at a typical efficiency of >99.99% at 0.1 to 0.3 micron sizes. An additional disposable pre-filter traps large particles in the inflow air prior to reaching the main filter, protecting against damage and prolonging life. Built-in solid-state variable speed controller is superior to conventional "step" controllers and offers infinite adjustment. The Soft Capsule Cleanroom is shipped unassembled with tools and parts for on-site assembly, turning an existing air-conditioned space into a cleanroom in a matter of hours. Complete factory test and certification, including airflow, filter integrity, particle counting, light and noise tests. Extensions for existing Soft Capsule cleanrooms.